The Zoo regrets to announce the death of one of its longest-lived female western lowland gorillas, Femelle. 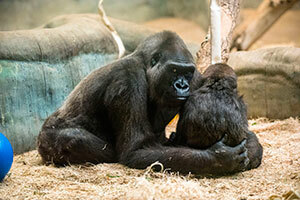 A wild-born animal, Femelle died Dec. 12, at an estimated age of 54. At 54 years old, Femelle was considered a geriatric gorilla and it can be common for older gorillas to suffer from cardiac issues. A necropsy (animal autopsy) for the cause of death is pending. Femelle arrived at the Milwaukee County Zoo in 1985 from the National Zoo in Washington, D.C. While at our Zoo, she gave birth to two offspring, one male and one female. At the National Zoo, she gave birth to one male. One of her longtime keepers comments that Femelle was very set in her ways, and wanted everyone around her to do things her way. In the last few years, she was more relaxed and playful, often seen kicking around a ball of woodwool (wood shavings used as bedding) with her feet. She also demonstrated maternal care and patience with the newest resident of the gorilla troop, 2-year-old male, Sulaiman. Femelle will be missed by keepers and visitors alike.